September 27, 2016, Washington, DC – Sister Donna Markham, OP, PhD, President and CEO of Catholic Charities USA, was active in the public sphere in mid-September. She was honored on September 15 as one of the NonProfit Times’ (NPT) 2016 Power and Influence Top 50 non-profit executives and, the next week, spoke as part of a panel on migrants and refugees at a side event at the United Nations. “Any recognition I receive is rightfully a tribute to the Adrian Dominican Congregation that has formed me, loved me and supported me throughout my religious life,” Sister Donna said in response to these events. 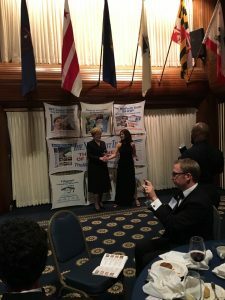 The NPT Top 50 Gala, held at the National Press Club, gave the honorees and their guests the opportunity to meet and interact with one another. They also listened to a keynote address by David Wilkinson, Director of the White House Office of Social Innovation and Civic Participation. Mr. Wilkinson spoke about the involvement of the White House with non-profit organizations. Honorees were then called forward one at a time to receive their special award from NPT. 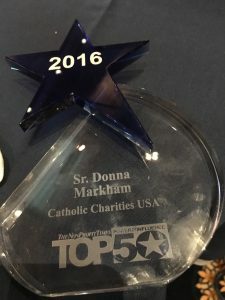 Sister Donna Markham, OP, receives her NPT Power and Influence Top 50 Award. Sister Donna, former Prioress of the Adrian Dominican Sisters, is the first woman to head Catholic Charities USA, a national network of 164 agencies who serve people in need. Services include disaster relief, food banks and pantries, emergency shelter and a variety of housing options, educational and training opportunities for adults and children, and advocacy on behalf of those who are in need. Since taking on the presidency of CCUSA in June 2015, Sister Donna has worked with the White House and both houses of Congress, imparting Catholic social values; represented Catholic Charities during Pope Francis’ visit to the United States in October 2015; and helped to coordinate organization’s vision for 2017-2022. “The ministry of Catholic Charities has been engaged in a process of identifying our strategic priorities for the next five years and articulating our vision for the future,” she wrote in a preface to CCUSA’s 2017-2022 vision. On September 19, Sister Donna described one of CCUSA’s 2017-2022 priorities – immigration and refugee services – while she spoke on a panel at a side event during the United Nations Summit on Refugees and Migrants. Sister Donna spoke of the growing numbers of migrants and refugees who take great personal risks to flee the dangers and hardship they face in their homelands and to find security and freedom in other countries. Watch the video of the panel discussion.